Freely accessible teaching materials are considered to be one of today’s most important trends in the field of educational policy. 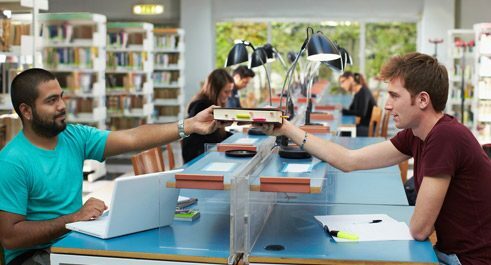 It is also a trend in which research libraries could play a key role. This is an interview with Jan Neumann, the Director of Law and Organisation at the Hochschulbibliothekszentrum (University Library Centre) of the state of North Rhine Westphalia in Cologne. OER is a collective term for learning and teaching materials that are licensed under an open definition. The term encompasses not only classic media like books or worksheets, but also new formats like videos, blogs, games and simulations. The main feature they all have in common is the fact that they are openly licensed, meaning that users are allowed to store the materials, make use of them, modify them and pass them on to others. Provided they are freely licensed, the term can also embrace what they call MOOCs (Massive Open Online Courses) – online courses that can be taken by a large number of participants free of charge. At university level Open Course Ware (OCW) continues to play a role – these are also a form of OER. They are openly licensed course materials that, in contrast to MOOCs, do not take the place of a course completely, but serve primarily as accompanying material to a course. I think that in this connection we are observing a paradigm shift. Up to now the situation had been that academic publishing remained the privilege of experts, legitimised by academic qualifications. Now, however, there are more and more voices that are fundamentally calling this system into question. The British mathematician, Timothy Gowers, describes the collaborative approach to promoting science and academic pursuits as sitting at the steering wheel of a car, when before one had only been allowed to push it. The prerequisite for this paradigm shift is a change in values, more towards cultural practices that place stronger emphasis on sharing and cooperating than has been the case up to now. A major one. The most important task for research libraries might well be the labeling of the OER produced by their institutions with high-quality metadata, so that a system is created in which the materials can later be located and used. At the moment the materials are very much scattered around in all kinds of different projects and are poorly labeled on all kinds of different servers. As a result the materials can very often simply not be located, which leads to them not being used – the main obstacle to OER being received in a more positive way. Furthermore librarians have many skills that could be particularly helpful when it comes to the production and administration of OER, for example, in the field of the technical infrastructure necessary for the management of resources. Alongside that, OER can also be used for the promotion of information skills – an activity that over the past few years has gained more and more importance in libraries. The first thing you have to be aware of is the way the university system functions. A university receives new students and external knowledge as input and transforms this input with the aid of the university’s value adding process into an output that consists of qualified graduates and new knowledge. The role of the library had always been traditionally related to the input side of the process, on the sourcing and provision of knowledge. Open Access has already brought about a fundamental change in this process, as the focus of the libraries has now moved to the output side, i.e. publishing new materials, for example. My theory is that OER is now going to change the role of the libraries even more and that by actively participating in the production of knowledge the libraries will move even closer towards the core of the universities’ value adding process than has been the case up to now. We are right at the beginning. In Germany we only entered the debate on the use of OER in 2012. In the meantime there is in fact quite a large number of projects and schemes. For example, The TU Darmstadt is running an OER platform called “OpenLearnWare”. In Hamburg they are planning to establish the “Hamburg Open Online University” that is being sponsored with 3.5 million euros. Nevertheless special OER projects for libraries are still the exception in Germany. In the USA they are much further ahead – there librarians represent in the meantime the strongest stakeholder groups in the field of OER. At the moment the mood is positive. At the beginning of 2015 a Joint Commission that was commissioned by the Kultusministerkonferenz (the assembly of ministers of education of the German states) and the German Federal Ministry for Education and Research submitted a joint statement that advocated increased activity in the field of OER. In addition the German national government surprisingly placed funding to the tune of two million euros at the disposal of OER, with which two feasability studies, among other things, are being financed at the moment. The OECD recently submitted a new report that in particular emphasised once again the innovation potential inherent in OER. The subject has definitely arrived on the educational policy scene. And by the way, I am convinced that the current refugee crisis is also going to promote the development of open and, therefore, free educational services. It would, however, be desirable if we did not just analyse and discuss the subject, but actually got round to putting it into practice as quickly as possible.